Before 1948, anyone who lived in the British Mandate of Palestine was de facto a Palestinian. 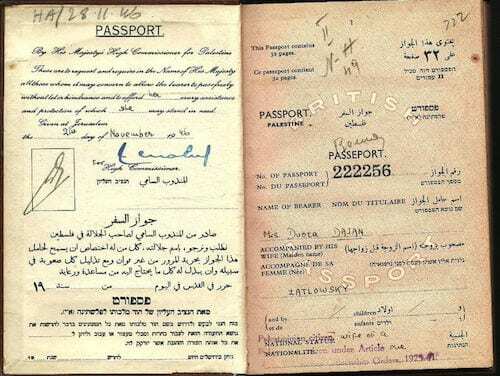 It didn’t matter if you were Jewish or Christian or Muslim, (see the Mandate passport of a Jewish woman dated November 21, 1946, clearly labeled “Palestinian citizen”). May 14, 1948 was an eventful day for the entire region. In the morning, the British pulled their last remaining personnel from the British Mandate of Palestine, which they had ruled since 1920. In the afternoon David Ben Gurion declared the creation of the State of Israel and became its first Prime Minister. In the evening, Egyptian planes began an aerial assault on Tel Aviv, and Israel’s War of Independence began. The Muslims call that day al–nakba (meaning ‘the catastrophe’) because it recalls the event that triggered the flight of hundreds of thousands of Arab residents from the brand new Jewish state, and led to their inability to return in victory. It is estimated that more than some 750,000 Arabs fled that war, when Arab armies from Lebanon, Syria, Iraq, Egypt, and Saudi Arabia attacked the tiny new state. The goal of the Arabs was to block the UN Partition Resolution, which divided the former British Mandate into Jewish and Arab portions, and to prevent the establishment of the Jewish state. Israel barely had an army, and what they did have was largely manned by civilians, many of whom were refugees themselves. Yet they faced the military might of five Arab states, and, despite those overwhelming odds, they prevailed. In July 1949, a final armistice was reached between Israel and the Arab states. Because of Israel’s successes on the battlefield, it was an armistice that gave the new state even more land that the U.N. had promised it in its 1947 Partition Resolution. At the same time 750,000 Palestinian Arabs were fleeing Israel, an equal number of Jews living in Muslim countries throughout North Africa and the Middle East were forced to escape from their homes in the face of harsh restrictions, appropriation of their property, and deadly riots. The large majority of those Jews went to Israel, where they were welcomed into towns and transition communities throughout the country. Over time, they were completely absorbed into Israel’s population. On the other hand, the Arabs who bolted from the new state of Israel were relegated to refugee status in the Arab countries to which they fled. Rather than absorb them into the general population, their new hosts placed them in squalid UN-run ‘refugee camps’ throughout the region, where many of the original refugees were forced to stay, some for generations. Today, some 1.5 million of the remaining refugees and their offspring are still living in these camps more than 70 years later. In 1949, the United Nations rewarded the Arab refugees with a refugee agency of their own, UNRWA. Its stated mission was “to carry out direct relief and works programs for Palestine refugees”. The Agency began operations on May 1, 1950, and made Palestinians the only refugees in the world whose status was inherited in perpetuity. That meant that although some 750,000 Arab refugees originally fled from Israel, UNRWA considers that all family members, whether through birth, marriage, adoption, and multiple generations are ‘refugees’ as well. As a result, today an estimated 5.9 million Palestinian ‘refugees’ are eligible for UN support and the ‘right of return’ to the homes of their ancestors in what is now Israel. The second agency is UNRWA, an organization that was established to deal specifically and only with the 750,000 Arab refugees who were displaced during Israel’s 1948 War. According to UNRWA’s own website, the definition that it uses for ‘refugee’ is “unique in terms of its long-standing commitment to one group of refugees.” UNRWA defined refugees as ‘persons whose normal place of residence was Palestine during the period 1 June 1946 to 15 May 1948, and who lost both home and means of livelihood as a result of the 1948 conflict.’” Looking back over the last 67 years, UNRWA claims to have “contributed to the welfare and human development of four generations of Palestine refugees”. UNRWA employs 30,000 people to carry out its mission. Instead of ‘successfully restarting their lives” and ending their “statelessness”, UNRWA’s mission has been just the opposite. Over the nearly seventy years of its existence, its primary mission has been to perpetuate itself by keeping the ‘Palestinian refugees’ stateless and trapped in their refugee status. They maintain their ‘refugee’ camps at minimum levels of habitability, forcing those who still reside there to live in squalor. UNRWA runs some 700 schools, providing classes for 500,000 ‘refugee’ children in Gaza, the West Bank, Lebanon, Syria and Jordan. In 2015, UN Watch released a report that documented 12 different Facebook accounts, operated by UNRWA officials, that openly supported and incited anti-Semitism and terrorism, and illustrated the impunity with which UNRWA’s culture of racism and incitement exists. Hillel Neuer, executive director of UN Watch, a non-governmental Geneva watchdog organization, said, “The pattern and practice of UNRWA school principals, teachers, and staff members posting anti-Semitic and terror-inciting images suggests a pathology of racism and violence within UNRWA that must be rooted out, not buried, as UNRWA spokesman Chris Gunness has attempted to do by calling for boycotts of newspapers or NGOs that report these incidents of hate”. 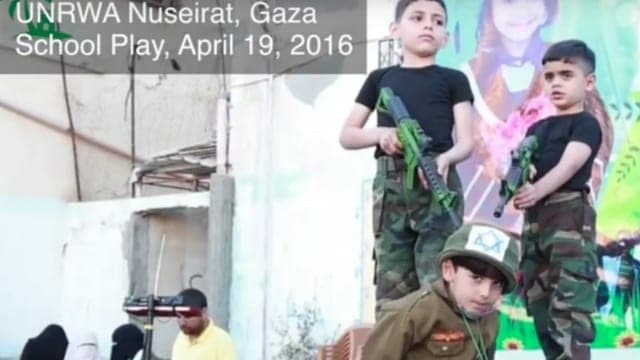 The schools support the vision of Palestinian children martyring themselves for the sake of ‘Palestine’ and destroying Israel and the Jewish people for the sake of Allah. Where Are the Refugees Today? It is estimated that fewer than 30,000 of the original refugees are still alive today. Many of the survivors are still living poverty in the UN ‘refugee’ camps. According to UNRWA, there are more than 1.5 million people living in “58 recognized Palestine refugee camps in Jordan, Lebanon, the Syrian Arab Republic, the Gaza Strip, and the West Bank, including East Jerusalem.” And UNRWA claims that there are some 5.9 million ‘Palestinian refugees’ worldwide who qualify for its assistance and for the ‘right of return’. If these uniquely defined ‘refugees’ were allowed to ‘return’, they would swamp the Jewish state, whose entire population – including Arabs – is only a little more than 8.5 million. In size, Israel is smaller than the state of Vermont. Were it to accept the terms of Palestinian ‘right of return’, Israel would be committing national suicide. In January 2018, the United States cut its annual funding to UNRWA to $65 million in aid. By comparison, in 2016, the USA gave UNRWA $368,429,712. The decision to provide only $65 million in funding was intended to level the playing field in which the US contributed a disproportionately large share of the support for UNRWA. UNRWA claimed that this drastic cut in funding resulted in a $217 million budget shortfall that will directly affect services and will cost several hundred jobs. President Trump linked the decision to the Palestinians’ refusal to speak with his administration after he recognized Jerusalem as Israel’s capital. But this is not the only reason for ending the mandate of this duplicitous organization. He and Jason Greenblatt, Assistant to the President & Special Representative for International Negotiations, have spearheaded a new round of initiatives to further peace negotiations between Israel and the Palestinians. Their approach is a sharp departure from efforts in the past, because they are being very realistic about the underlying duplicity that the Palestinians have been employing for many years. The statement was preposterous, because he suggested that the infusion of one billion dollars in financial aid into Gaza, an infusion of capital that goes directly to the people through reliable agencies (not UNRWA, Hamas, or the Palestinian Authority), would be a bad thing. He ignored the fact that this new system of financial aid will finally free the millions of so-called ‘refugees’, who never fled from anything, This is something that UNRWA should have done decades ago. The naysayers claim that the dismantling of UNRWA would cause a humanitarian catastrophe, but UNRWA has already done that. Instead of helping the original refugees make new lives of their own, they perpetuated their statelessness and their refugee state in poverty and misery, and created generations of suffering. It is time, seventy years later, to end this charade that UNRWA has done anything to help the ‘Palestinians’ anywhere in this world. The plan to dismantle UNRWA must contain a blueprint for ensuring that a vacuum is not created in its place, but a new organization is not needed to fulfill this mandate. There are many organizations that can step in and provide the various services of the one organization that failed so miserably to help the people they were instructed to serve. A revised education program can hopefully de-program the damage done by UNRWA to the Palestinian children. In addition, international service agencies can provide health care, infrastructure, basic supplies including food, clean water, and medicine, as well as health care services, all need to be supplied by agencies that are uncorrupted by Palestinian politics. The road to peace between Israel and its neighbors will never be paved by the hate and intolerance that has been promoted by UNRWA in the guise of humanitarian kindness. Peace will only be possible when the insatiable hunger for Israel’s destruction that sustains its adversaries is replaced by a longing for peace that is greater than its lust for war, with the collaboration of men and women who value life more than death. It is time for the ‘refugees’ of 1948 to finally be free, to reclaim their lives, and to replace the ever-present threat of war with an attainable peace. In Gaza, peace is still far away, and the culture of hate is still very strong. As this article goes to press, Israel and Hamas are preparing for war. In the last two days, Hamas has fired over 200 rockets into Israel, and Israel has retaliated with air strikes on over 100 military and strategic Hamas targets. The people of the south of Israel who have been the most threatened by Hamas are now urging the IDF to go into Gaza and put an end to the terror they have been living under for months. The end is not in sight, but President Trump has signaled a new approach that does not pamper the terrorists of the PA and Hamas. It is another example of his ‘peace through strength’ approach and, where all else has failed, this may yet work. Stay tuned.